Well, it has been a while but I’ve rejoined the Crumpet’s Nail Tarts group! If you don’t already know, Debbie (The Crumpet on IG) heads this challenge. Every week we, the Nail Tarts, take part in a prompt and post it to social media. This week is “Black and White Valentine’s”. I sort of kind of hit this prompt but varied it with some bright neon purple. Don’t get me wrong, I adore black and white. I think it looks smart and sleek but I have to be in the right mood for it. And, this week, I am not. Also, I recently learned American Apparel is downsizing like mad and they no longer carry their super amazing nail varnishes. So, I dug out one of mine and used it in today’s look! I love the sketchy feel of this look. It’s very Valentine’s without being to in your face like the Hershey’s holiday (is that the term??) I hope you like it! What do you think, let me know in the comments! 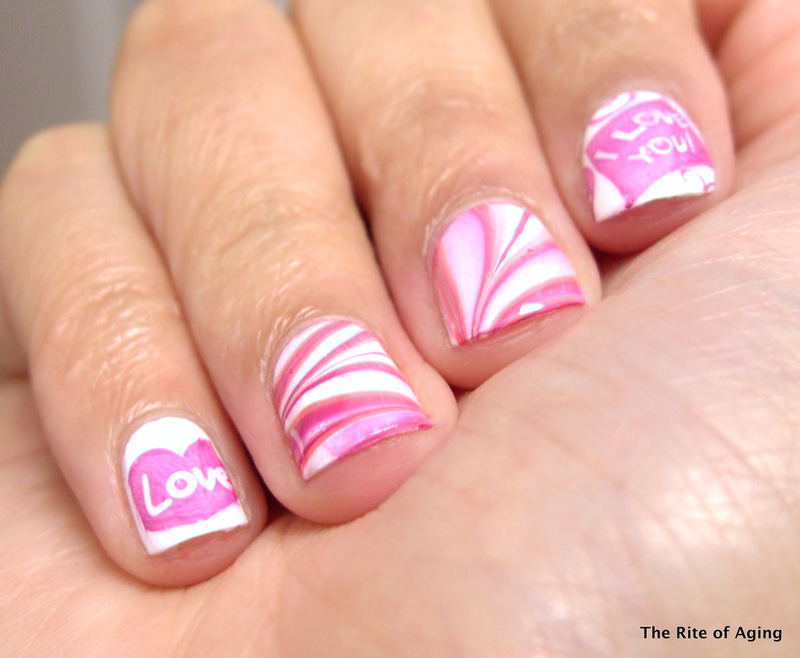 I wanted to come back to the love letters prompt for this month’s Challenge Your Nail Art. While I do not do the gushy, romantic stuff of film and book I wanted to use the Pueen stamping plates I would not generally use at any other time of year! I have to be honest, though, I do not like white nail polish. Not because of the consistency (which, okay, I have a problem with) but the color is so stark my camera does not photograph my skin tone well and the polish always muddies the others in the marble. It is a very annoying color. Anyways, I hope you like my Love Letters nail art! I started with Sinful Colors Snow Me White as my base. I marbled with Barry M Grapefruit, Rhossili and Sinful Colors Snow Me White. I stamped with Barry M Matte Rhossili and Pueen Cosmetics plate PUEEN 43 from the Love Elements collection. Check out the other love letters below! I had this cool idea to do a dotticure, top coat it, then saran-wrap black on top. I think it might have looked really cool but when I actually finished the base, I did not want to cover it up at all! I used varying red and pinks but the finished look kind of reminds me of chocolates, somehow! 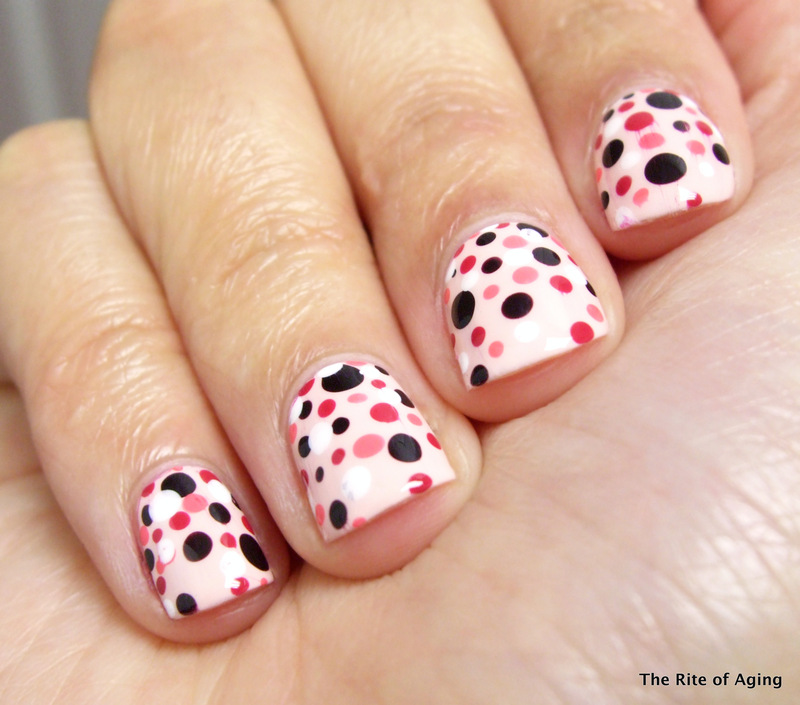 So…for the fourth prompt of this month’s Challenge Your Nail Art…I present my Valentine’s Day dotticure! I started with 2 coats of Sally Hansen Insta-Dri Petal Pusher as my base. I dotted with OPI Lincoln Park After Dark, Dance Legend 373, Barry M Gelly Grapefruit and Milani (new) Spotlight White. Don’t forget to check out the other Valentine’s Day nails below!